The Advanced Microwave Scanning Radiometer 2 (AMSR2) onboard the GCOM-W1 satellite is a remote sensing instrument for measuring weak microwave emission from the surface and the atmosphere of the Earth. From about 700 km above the Earth, AMSR2 provides us highly accurate measurements of the intensity of microwave emission and scattering. The antenna of AMSR2 rotates once per 1.5 seconds and obtains data over a 1450 km swath. This conical scan mechanism enables AMSR2 to acquire a set of daytime and nighttime data with more than 99% coverage of the Earth every 2 days. AMSR2 is a successor to AMSR on Japanese ADEOS-II and AMSR-E on Aqua, a NASA satellite. 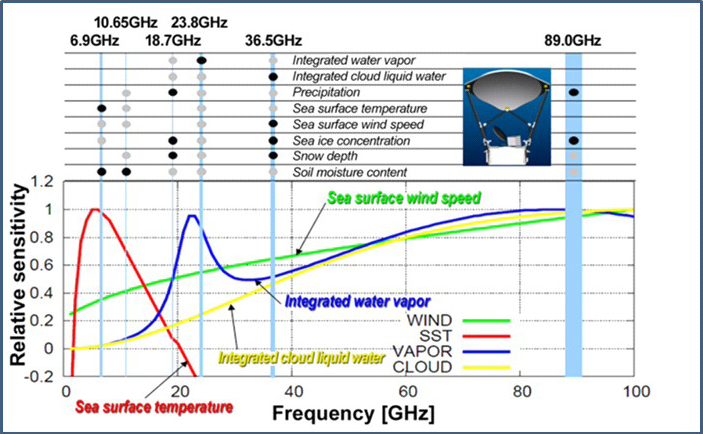 For water vapor and cloud liquid, only the contribution by itself is considered (e.g., oxygen absorption is not included). Incidence angle is 55 degrees. Page updated on October 23, 2015.